POST ABUSIVE COMMENTS, BIG SUPPORT TO ATLEE! Director Atlee is currently directing Vijay’s Thalapathy 63 which is produced by AGS Entertainment. He has given back to back Super hits with Thalapathy Vijay namely Theri and Mersal and so has gained his own fan base. His debut film Raja Rani with Arya, Jai, Nayanthara, Nazriya was also a hit film, which is still popular when aired on Television. 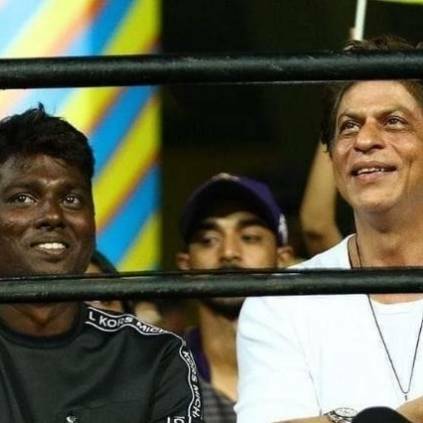 Recently, Atlee had attended the ’CSK vs KKR' IPL match in Chennai’s Chepauk Stadium and he was seen seated next to Shah Rukh Khan. Immediately there were high speculations in the media about a possible cameo in Thalapathy 63 or Atlee’s directorial debut in Bollywood with SRK. While the internet has always had a share of negative shade, some went on to make abusive remarks about Atlee which created great rage among his fans. Atlee has been a successful director who has given great hits for all his cast members and is known for his presentation skills and portrayal of emotional scenes. Just as how success counts on talent and hard work, his fans showed their love towards the director on social media after the negative remarks. The big buzz here is a trending post on Facebook that is shared by netizens after the negative remarks during the match day. As an icing on top of the cake, now it has been confirmed that Atlee is all set to direct Shah Rukh Khan in a Hindi film. This has brought joy to his fans by giving one more reason to celebrate him. What Atlee has in store by helming Shah Rukh Khan in his first Bollywood directorial is a great suspense and surprise awaiting to all. People looking for online information on Arya, Atlee, Bollywood Debut, Jai, Nayanthara, Nazriya nazim, Shah Rukh Khan, Vijay will find this news story useful.